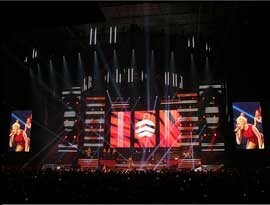 UK - Creative Technology (CT) has supplied a video control system and LED screens package, crew and pre-programming services for Jessie J’s epic diva-style tour ‘ALIVE’. Brilliantly complementing the pop sensation’s considerable stage presence, Vince Foster’s set and lighting design offered a vivid mix of stunning lighting looks, and hot-to-trot pyrotechnics, while Paul Caslin’s clever mix of video production delivered sparkling video effects. The look and size of the show was ambitious. Caslin’s pre-recorded content was mixed with live camera feeds, directed by Steve Price, and broadcast across three portrait hung Flyer 12 touring LED screens positioned centre stage. In addition, two portrait I-Mag screens, also using Flyer 12, were hung either side of the stage taking care of the live camera close ups of Jessie J. All screens were provided from CT’s inventory in London. 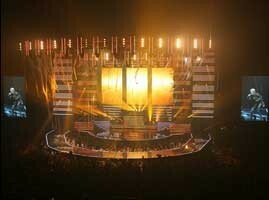 Over 300 of BARCO MiStrips served to sculpt and shape the set while Video Strip was embedded in the stage floor. The diversity of LED resolutions created a spectacular backdrop that delivered unique looks for each of the five sections of the show. Kicking off with moody, wide-stage monochromatic looks, Foster’s design then launched into pop-bright dance states and climaxed with a glittering champagne gold finale complete with gold confetti. Although rich and varied to watch, the beauty of the show, from a technical perspective, was its determined simplicity. Using intelligent video mapping, programmed on Ai Media Servers, the team at Creative Technology enabled innumerable, multi-dimensional video and lighting looks to be generated from a single image layer. "What made the Ai Media server particularly useful for this was the 3D desktop visualizer," explained Creative Technology’s director of business development, Adrian Offord. "This allowed the creative team to see how the content would work on the set in the virtual world, while the set was still being built. For two weeks prior to rehearsals video programmer Nick Clark-Lowe was able to work in our studios programming and time-coding the content." In addition four live cameras, directed and mixed by Steve Price, fed into the look. The set up comprised a small custom-built PPU frame controlled by a Panasonic 450 mixing system with a multi-viewer output. This simplicity in design further extended to the pre-recorded content as CT’s project manager, Nic Maag explained: "We used just one 1080 video image across all the screens to deliver the entire pre-created content for the show. This essentially meant that all the Video Strip in the floor, the 300 pieces of MI-strip and all five of the Flyer 12 LED screens were fed a single 1080 image mapped to the hardware using the Ai Servers." The success of the system was grounded in the work of Creative Technology’s on-site engineer Rob Currie and senior engineer Will Harkin. Currie and Harkin spent time programming and testing the system, eventually electing to use four-channel Data Path capture. In terms of ‘live’ camera content, director Steve Price was in control over four cameras and also controlled the output level of the screens. In order to achieve as low a delay as possible the live camera system had been designed to allow Price to control the AI graphics card direct, without going through the server’s engine. Price comments: "Working with Creative Technology is always a joy. What sets the company apart for me is that the engineering team is the best I’ve ever worked with. They are fantastic. They understand that my role is to create the visual look and that I have limited technical skills. They always ensure that the systems are set up so I can get on with my job without concerning myself with technical detail." The Jessie J Alive Tour completed its UK leg in November and takes off to America in the New Year for a three-month tour.